Three years ago, I tried making my first original pattern: a pair of crocheted fingerless owl gloves for Wyatt. Last week, I published my latest (and best) version of those owl gloves: Pop-Up Owl Mittens. They are knitted (not crocheted), with or without half-fingers, and they have a convertible mitten top. In other words, I have learned a lot in three years. In 2012, when I found myself getting back into projects with yarn, I had zero confidence in my knitting ability. Years ago, in high school, I had knit myself several sweaters, but you would have never guessed it. By 2012, I could do nothing useful with two needles at the same time, and the thought of dropped stitches deterred me from trying. For whatever reason, though, crochet felt doable. First, I crocheted myself some "steamer trunk" grey fingerless gloves. Once my hands were warm (secure your own oxygen mask first! 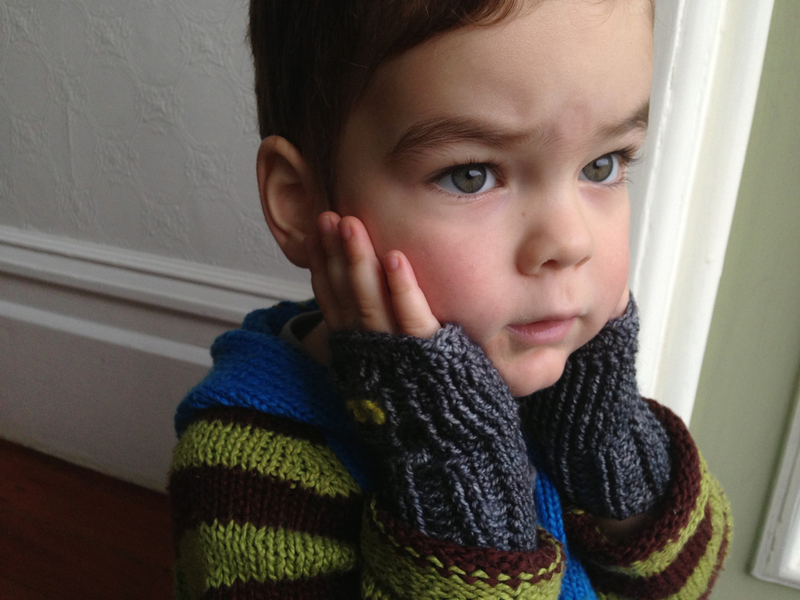 ), I realized that Wyatt's hands were probably cold on winter preschool hiking mornings. So I improvised some crocheted gloves for him, and I included a little owl on the front. Our fingerless gloves were good, but not great. I knew that (from a distance), our gloves looked knitted, but for some reason, the crochet-masquerading-as-knit bothered me. Also, I didn't love the super cushy crocheted fabric. But those reservations didn't stop me from making Wyatt a bigger size of crocheted owl gloves the following year. Not only had the first owls grown tight on him, but they were so well-loved their eyes had unraveled. Wyatt opted for purple wool for his second pair. By fall of 2015, Wyatt had outgrown his purple owl gloves. It was time for another new pair, and by then, I was ready to take a new approach. I had already successfully knit him his striped hoodie without a pattern, so when he asked me to make him a pair of owl gloves that had half-fingers in them, the project seemed very doable. I proposed we add a flip-up "hat" to keep his fingertips warm, and Wyatt thought that was a splendid idea. The first version of these imagined gloves, however, was not splendid. The thumbs were a little wonky, and the cuffs and pop-up tops were too loose. Every time Wyatt wore them, he requested that I PLEASE make the next pair so that he didn't have to keep pulling the mittens back on to his hands after walking a block or two. A fair criticism if ever I've heard one. So I went back and knit the convertible mittens again, based on the notes I had written as I was knitting the wonky-thumbed-ones. This time, though, I knew I was close to a good design, so I used the yarn Wyatt had chosen as his favorite: Sincere Sheep's Shepherdess yarn in Vitamin C. This version turned out so well that for awhile, Wyatt refused to wear them out of the house for fear of messing them up. Eventually, he came to believe me that we could wash them, and in the worst case, I could always make more. They look adorable and Wyatt finds them totally functional. But not everyone loves the color orange. And as Brooke Sinnes (of Sincere Sheep) explained when I visited her in her booth at the gigantic trade show that is Stitches West, sometimes it's hard for people to imagine what a pattern will look like in other colors. Brooke's inspired recommendation to embrace a "seasons" color palette for my first trio of patterns (which includes the Pop-Up Owl Mittens) was perfect. I set off with some of her Cormo Worsted and made smaller and larger sizes of the Pop-Up Owl Mittens. I am so pleased that after writing (and, thanks to my patient editor, rewriting) this pattern, anyone who feels like knitting can make their own Pop-Up Owl Mittens...in less than three years.